Please excuse our tardiness. The fish have been keeping us busy. Very busy. October has started off strong and looks to only get stronger. Fly fishing has been solid all around the Bozeman area. Cooler weather has started to set in and we’ve already seen some snowy days on the river. The crowds of summer are a distant memory, and even the more popular floats on our local rivers have been quiet. Just you, the trout, and maybe a bugling elk or two. There’s lots of water still pushing through our rivers for this time of year. No shortage of options for our anglers. 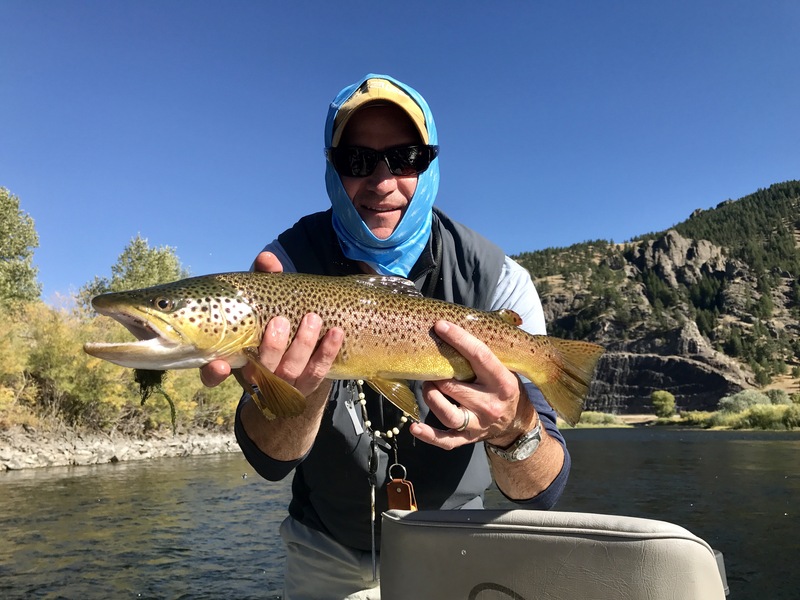 October has always been a favorite for our anglers and Bozeman fly fishing guides: low pressure and great fishing. We expect this year to be the same. BWOs have started to show up on the Missouri River in great numbers, as well as the Madison and Yellowstone Rivers. Expect these hatches to only improve as the bugs increase in size throughout the month. Fishing on the Paradise Valley Spring Creeks has also been great and will only improve as the month progresses. There is something for every angler in October in Montana. No need to get out early. Wait until the morning cold breaks, then hit the water. Nymphing is generally outstanding and some of the largest fish of the year will be taken on streamers. For the dry fly junkies, great hatches of BWOs and midges will make for good action all afternoon. Good time of year to bring all of your layers, jackets, and long johns along. You never know what mother nature will throw at you. Whiskey and hand warmers help too. Come prepared and enjoy fall fly fishing in Montana at its finest.